Spectacular fields, competitive racing and the chance for non race-goers to dress up. Derby Day provides something for everyone. The heart of the Spring Carnival is here, with Flemington’s Cup week upon us. 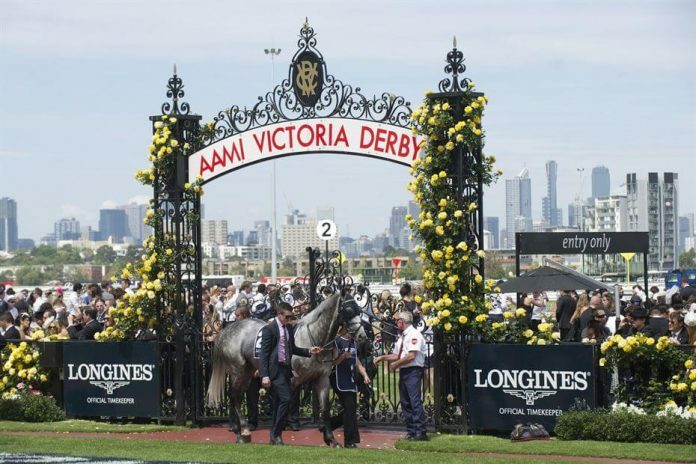 Derby Day is the best day of racing anywhere in the southern hemisphere, and though this year’s Derby is certainly not a classic like other years, it is highly competitive nonetheless. PRIZED ICON flew last year, going 115, that’s a very high figure for a Derby winner, however as you can see all four have rated quite well, 111 being the lowest. Comparing that to this field, the highest figure I have given is 108, so I don’t expect this to be a high rating year, however you never know, something can always improve and jump out of the box to rate high. Before I go on to the speed map, I should inform you that I have done this preview taking no track bias into account. 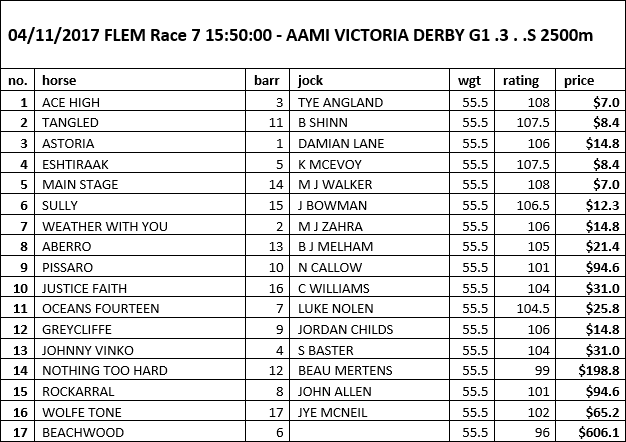 I am not betting races 1&2, and I will be assessing then to see if there’s a pattern (EG Derby day rail true dynamite rail bias as it can be), and if there is I will be adjusting my markets, but for now my form has been done assuming a fair track. I think the pace will be OK, they’ll probably try to take a break at some point, but it’s a long race and in the end they’ll probably sort out an order. I think SULLY and JUSTICE FAITH will probably go back further to get in. As you can see, I have it very even, very open, which is to be expected when I don’t predict it to be a high rating race. Therefore, I won’t be taking short odds about anything, and at this stage there looks to be value in ESHTIRAAK, ABERRO, and a few others pretty close to being overlays too. What would my suggested play be? Well, don’t blow the bankroll on this query race! I will be backing the overlays but not big bets in such an even race. Follow my prices and back the overs. See below for runner by runner description.